40 • FOODSERVICE EQUIPMENT & SUPPLIES • JANUARY 2014 F ounded by media entrepreneur, environmentalist and philanthropist Ted Turner, along with celebrated restaurateur George W. McKerrow, Atlanta-based Ted's Montana Grill sources ingredients that are produced locally and in a sustainable manner. That choice is part of the chain's DNA; in fact, fresh produce is a hallmark of the chain. This summer, it partnered with Greener Fields on a groundbreak- ing sustainability and local produce initiative in all 44 of its locations. As a result, Ted's Montana Grill also needed a refrigeration system that better controlled the temperature and humid- ity in its walk-in coolers. "We receive produce deliveries two to three times a week, and all of it is stored fresh, not frozen," says Eric C. Hankinson, the Ted's Montana Grill director of facilities and furniture, fxtures and equipment (FF&E). "The problem stemmed from maintaining temperatures within the walk-in, which were not as energy effcient as we would have liked." Refrigeration temperatures would regularly fuctuate between 38 degrees F and 45 degrees F, and high humidity in the box would adversely impact the fresh produce. "We had some concerns that refrigerated products were not being maintained to our desired level of freshness during their shelf life," Hankinson says. "Our strict quality standards sometimes meant that we were discarding products before the planned dates." The chain looked at the various refrigeration systems available and zeroed in on the Heatcraft Beacon II ™ , manufactured by Heatcraft Worldwide Refrigeration. The advanced electronic control optimizes refrigeration system performance, delivers diagnostic capa- bility and improves energy effciency. This system includes a control interface and Smart Defrost, which analyzes system performance to determine if the unit can skip a defrost cycle. Skipping unnecessary defrosts not only enables Ted's Montana Grill to save money on electricity, but also improves product in- tegrity by limiting how often the walk-in temperature is increased for defrosts. What helped seal the deal was the company's ability to test, monitor and evaluate the Heatcraft system's perfor- mance at the Ted's Montana Grill location near the Heatcraft North America offce. After the system was installed, food quality immediately improved and shelf life increased. "Our produce is look- ing better longer," Hankinson says. "Not only was the food quality better than with the previous system, but the system maintained the correct tem- perature. Within fve minutes after the door is closed, the walk-in returned to the proper holding temperature." 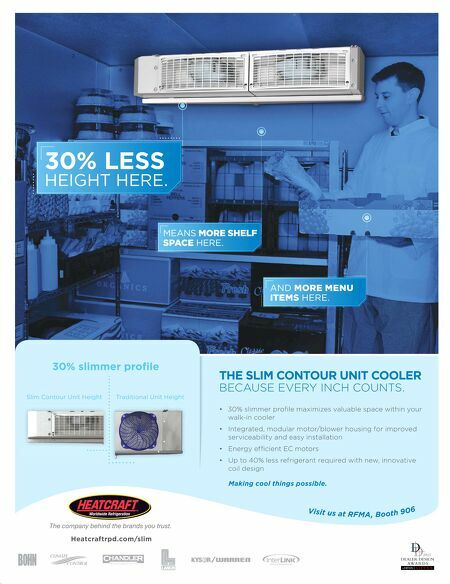 The Heatcraft Beacon II refrigera- tion system provided better overall per- formance, while reducing the walk-in cooler's energy consumption by more than 20 percent. With the Heatcraft Beacon II's energy-saving split-system options, there are fewer defrosts, which decreas- es daily fuctuations in space tempera- ture and reduces energy consumption due to less defrost heater run time. Ted's Montana Grill is currently working on installing the Heatcraft Beacon II in two more of its locations and eventually plans a chain-wide roll- out. "All of our restaurants are between 7 and 11 years old, so we are planning to replace almost 2 dozen units in the next few years," Hankinson says. SPECIAL ADVERTISING SECTION t FRESH - TO - TABLE FUSS CASE STU Ted's Montana Grill, Atlanta Heatcraft Worldwide Refrigeration, Stone Mountain, Ga. Ted's Montana Grill • Type of service: Casual dining • Number of locations: 44 • Revenue: More than $100 million in 2012 • Challenge: The chain required better control of the temperature and humid- ity levels in its walk-in refrigerators to help maximize shelf life for its locally sourced produce items. • Solution: Heatcraft Beacon II refrigeration system in walk-ins • Results: The chain is experiencing longer shelf life for its produce while reducing energy consumption by up to 20 percent. Ted's Montana Grill recently partnered with Greener Fields on a groundbreaking sustainability and local produce initiative in all 44 of its locations.